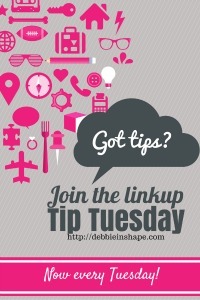 Welcome to Tip Tuesday Linkup Party #10! I would like to invite everyone to stop by Debbie’s post if you have not done it yet. Top 3 Tip Tuesday #9: Stephanie, Jackie and Leanne. My most deepest thank you to everyone who participated and is helping our link party grow! And make sure you visit the participants, whether you are a blogger or not. That is what link parties are all about! ATTENTION: If next week we do not reach enough clicks to choose for a top 3, the spotlights will be chosen randomly through InLinkz.